When will Azeri Central East Project obtain first oil? First oil production from the Azeri Central East Project, which is a part of the project for development of Azeri-Chirag-Gunashli (ACG) block of oil and gas fields, will be implemented in 2023, theEnvironmental and Social Impact Assessmentby BP says. The ACE Project represents the next stage of development in the ACG Contract Area. "The ACE-PDQ (production, drilling and quarters) platform will be located mid-way between the Central Azeri (CA) and East Azeri (EA) platforms in a water depth of approximately 137 meters. Infield pipelines will be installed for the transfer of produced oil and gas from the ACE-PDQ platform to the existing ACG Phase 2 oil and gas export pipeline. In addition, there will be a water injection pipeline installed between the EA-PDQ and ACE-PDQ platforms to supply injection water from the CA-CWP (compression and water injection) platform to the ACE-PDQ. A combined power (to supply back up power) and telecommunications subsea cable will also be installed on the seabed from EA-PDQ to ACE-PDQ," reads the document. The ACE Project offshore facilities have been designed to process up to 100,000 barrels per day (Mbpd) oil (commingled with produced water); and up to 350 million standard cubic feet per day (MMscfd) gas. "The majority of the onshore construction and commissioning activities at the construction yards are expected to occur between mid-2019 and mid 2022 based on the current schedule. It is anticipated that first oil will be achieved in 2023 following completion of installation, tie-back of the predrill wells and start up activities." The ACE Project also takes account of a wide range of international and regional environmental conventions and commits to comply with the intent of current national legal requirements where those requirements are consistent with the provisions of the PSA, and do not contradict, or are otherwise incompatible with, international petroleum industry standards and practice. The ACE Project will also adhere to the framework of environmental and social standards within the ESIA approved by the Ministry of Ecology and Natural Resources (MENR). The PSA also makes reference to international petroleum industry standards and practices with which the Project will comply. Therefore, each phase of the ACE Project will be subject to formal environmental and social management planning. During predrilling, construction, installation and HUC, the main contractor companies will be contractually required to develop and implement environmental and social management systems (ESMS). An Environmental and Social Management and Monitoring Plan (ESMMP) will also be prepared to manage the specific environmental and social requirements associated with the construction, HUC and start up phase activities. The contract for developing the ACG field was signed in 1994. A ceremony to sign a new contract on development of the ACG block of oil and gas fields was held in Baku on September 14, 2017. The AzeriChiragDeepwater Gunashli is a complex of oil fields in the Caspian Sea, about 120 kilometres (75 mi) off the coast of Azerbaijan. It consist of Azeri and Chirag oil fields, and the deepwater portion of the Gunashli oil field. An overall estimated area of the development is 432.4 square kilometres (167.0 sq mi). It is developed by the Azerbaijan International Operating Company, a consortium of international oil companies, and operated by BP on behalf of the consortium. The ACG fields have estimated recoverable reserves of about 5 to 6 billion barrels (790 to 950 million cubic metres) of petroleum. The oil from the ACG field was pumped to Sangachal terminal south of Baku and from there routed to foreign markets by Baku-Supsa pipeline, BakuNovorossiysk pipeline and BakuTbilisiCeyhan pipeline. The second stage of the development consisted of the development of the Azeri field. The development of Azeri field started in 2002. Central Azeri living quarters arrived in Baku in July 2003 and drilling modules arrived in Baku in July 2003. The Central Azeri jacket was completed in March 2004. To accommodate addition oil, the Sangachal Terminal was upgraded in March 2003. After installing the Central Azeri gas pipeline, the Central Azeri platform was launched in July 2004. The platform was installed by October 2004, and production started in February 2005. The Central Azeri compression and water injection platform topsides was launched in July 2005. It injected first gas in May 2006. West Azeri drilling modules arrive in Baku in August 2004 and the platform launched in May 2005. 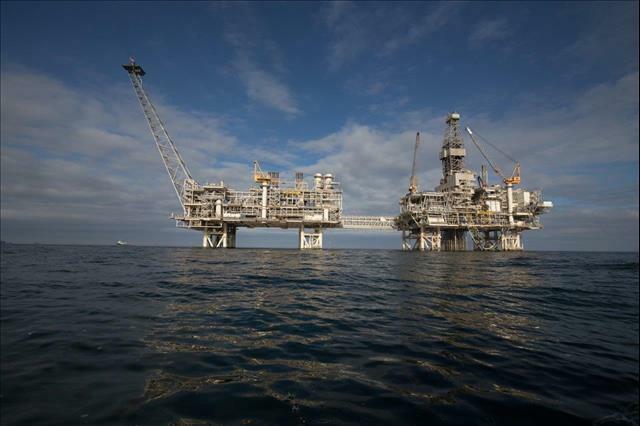 The platform's topsides was installed in September 2005 and production started in January 2006. East Azeri drilling modules and quarters arrived in Baku in June 2005 and the platform was launched in March 2006. The topside was installed in March 2006 and the production began in October 2006. The Deepwater Gunashli pre-drilling program started in December 2005. Drilling modules and quarters arrived in Baku in June 2006. The platform became operational in April 2008.